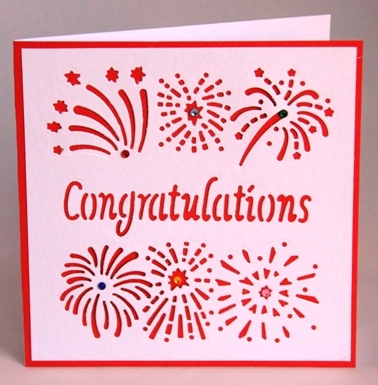 I have die cut the word Congratulations in the centre of a square of white card. This is bordered top and bottom by a die cut design of fireworks. Each of the fireworks has a different coloured acrylic gemstone set in it – red, pale blue, green, dark blue, yellow and pink. The design is set onto red card. The inside of the card, which is white, is blank for your own words of congratulations. If ordering by phone, please reference card #477.